A while back a friend gave me some very specific instructions on how to get the credit for three MB-1377s. Well . . . I think it worked. I don't think it's any great secret that many of the games I run lately owe a debt to Joss Whedon's Sci-Fi Space Western. After all, it fits. The plots to his shows could have been rolled up in Rogue Trader and he's borrowing from the same sources as all the rest of us anyway: Star Wars, the old Battlestar Galactica, A Fistful of Dollars, Yojimbo, you name it. There's inevitably going to be some commonality between one Western in space and the next. But his Western had one significant thing mine was still lacking. No, I don't mean horses. (Though there is that too.) He had a spaceship for his ensemble cast. And that is what I most wanted. There were a few things required of the spaceship: it had to be large enough to plausibly carry a dozen or so people and a useful payload. It had to be neat looking. It had to fit inside my budget. 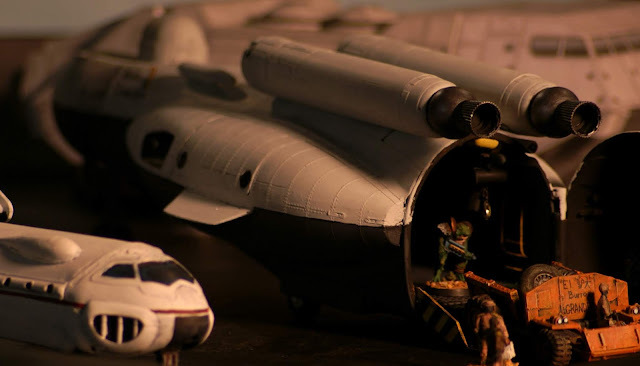 And I wanted a what in theatre would be called a "practical" cargo bay. (A "practical" door or window actually opens. A practical faucet runs when you open the tap. You wouldn't necessarily drink it, but water comes out. It functions in some obvious way.) I'm a fan of what the Gov' General over in Sector Six calls "bathtubbing," whereby you leave out the unnecessary things and compact things for scale. But even using a fair bit of that I still wanted a larger than usual model. There's only so small you can make a thing and still fit your bathtubbed truck into the cargo hold, for instance. This one had some physical minimums if I wanted it to be "practical." 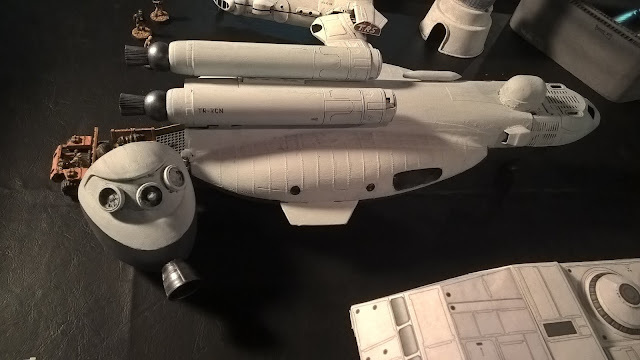 I've also had a theory for a while now that spaceships and submarines have a few things in common, thus submarines would be a good source of inspiration for spacecraft art. So I set out on a quest to find appropriate children's toys and submarine models. The orange creature below was one of several somewhat promising broken toys I found in charity shops for the purpose. It . . . seemed far fetched, but the hinged nose, low floor, and large diameter made me think it might work. 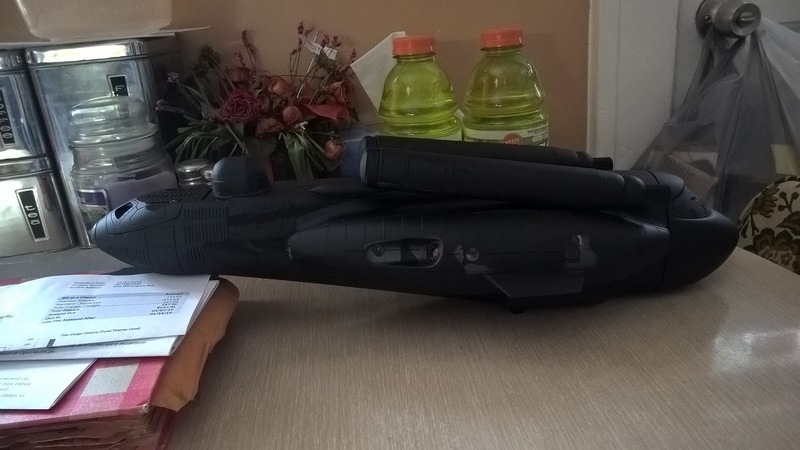 Lying next to it are two halves of the hull from a model submarine I found on eBay. 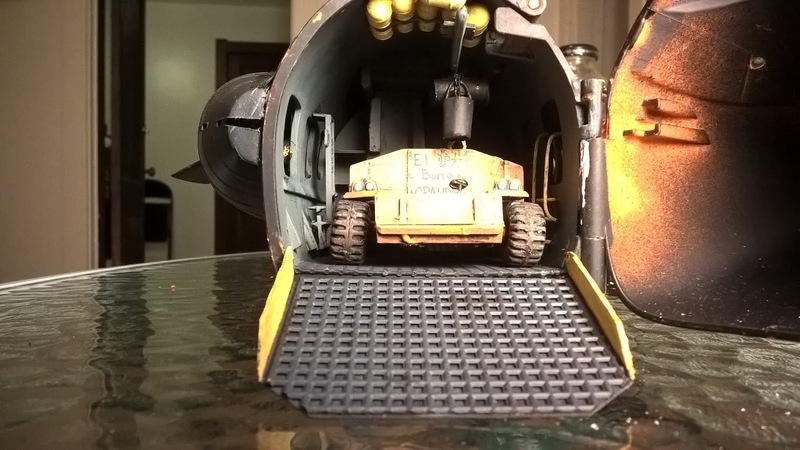 This is an old Revell SnapTite kit, and I loved the look of the thing and figured between the two items maybe I could get somewhere. 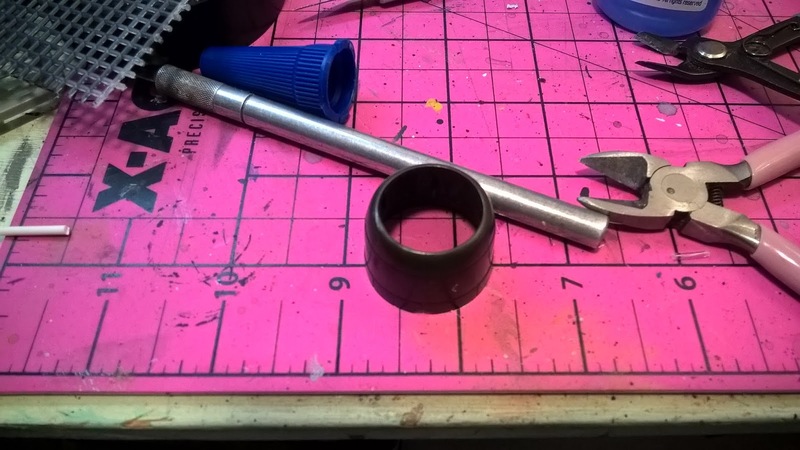 I knew I only wanted to use the airplane for part of the hull, so the first step was removing the end I wouldn't use. In this case I cut off the "tail," which was really too small and kidsy anyway. The "nose" would become the aft end of my ship. 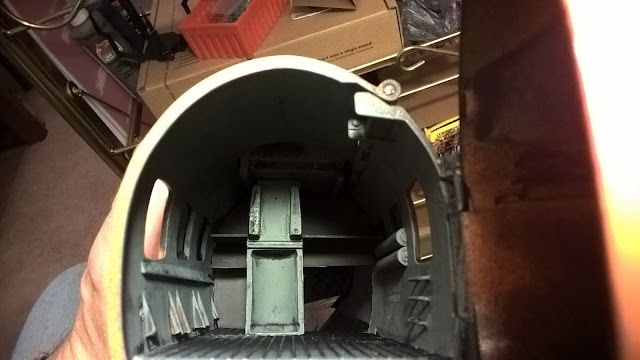 At this point I also added the first details to what would be the cargo bay. This still left me in a bit of a quandry about the forward section of the ship. I'm getting to be a fan of cardstock, but I didn't want to craft the cockpit entirely from scratch. At some point, in one of the Governor General's posts, he pointed out a line of modular Matchbox rescue toys. While looking through that I discovered some large shuttles that looked really promising indeed and came across several job lots on the bay. I feel quite certain this will provide several spaceships, some surface vehicles, and maybe even a few buildings. 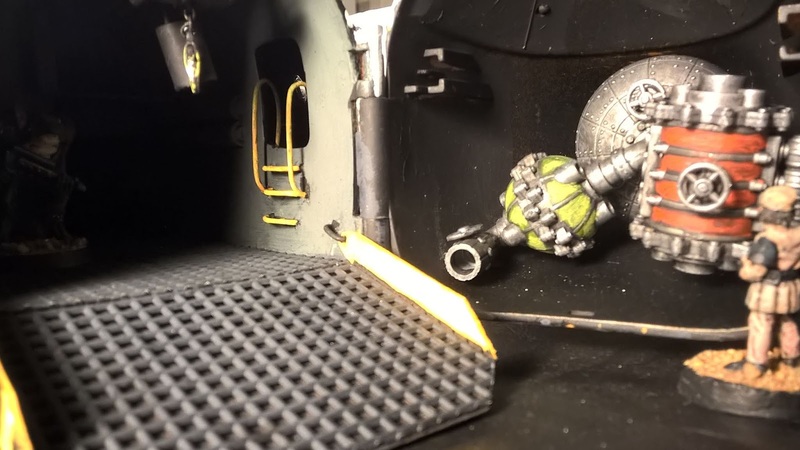 (It's worth noting the specific cockpit that went into the gangs starship was removed from the box before any of those pictures were taken.) In any case, with cockpit in hand it was finally a matter of finishing up the middle. Cardstock provided a solid middle. 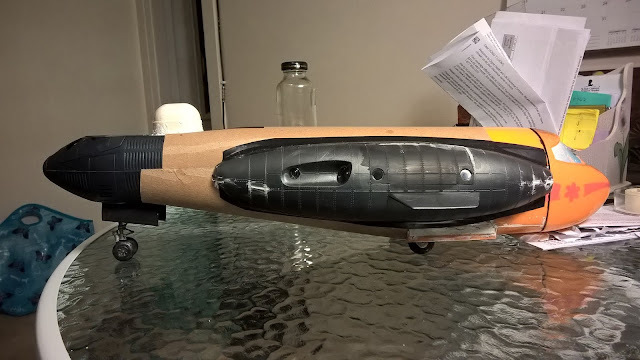 The first piece was formed over the top of the rear section, glued in place, and then fitted down to the cockpit. 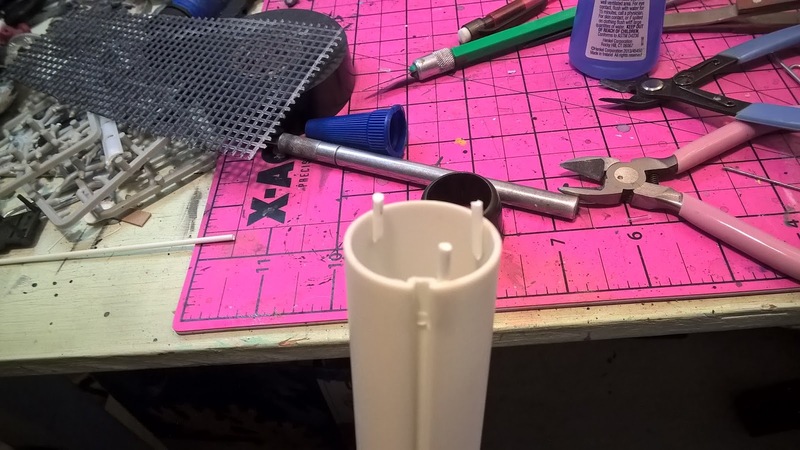 I marked and measured the second piece in order to cut it into a more roughly conical section and then glued it in place as well. 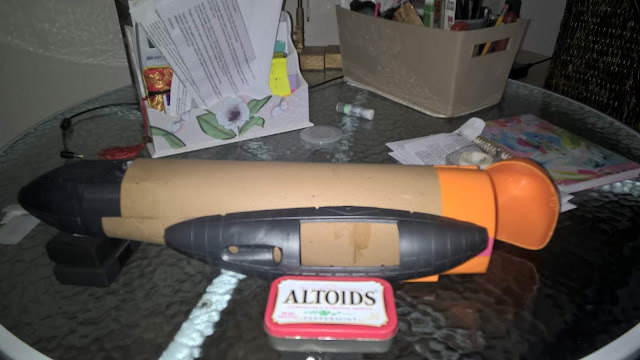 The cardboard would cover all but the aftmost two windows of the toy jet hull. These would become doors onto a gallery level somewhat above the cargo floor. The submarine would provide the hull sections of this gallery or wing level. (And it is on this gallery level that I imagine the crew and passenger accommodations to be. 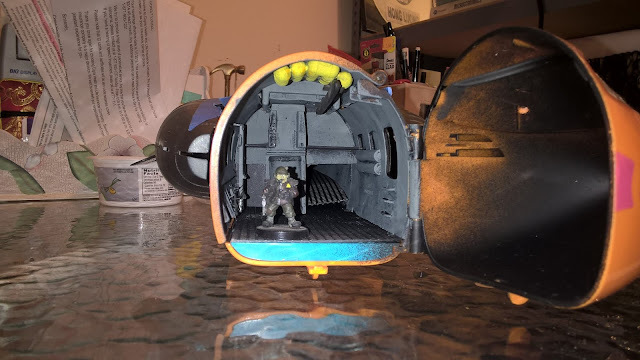 I briefly toyed with detailing the interior here, but it would be nigh unto impossible to see through the tiny windows, so I abandoned the interior aside from the cargo bay. At this point I needed propulsion. I had originally planned to use some transformer parts leftover from the TransRim MB-1210 Starshuttle project. I even went so far as pinning them in place. Before deciding they looked terrible and I didn't like them and pulled them right back off. At this point I undid nigh on half the build, cutting cardboard and deciding I wanted to add more detail to the bay. 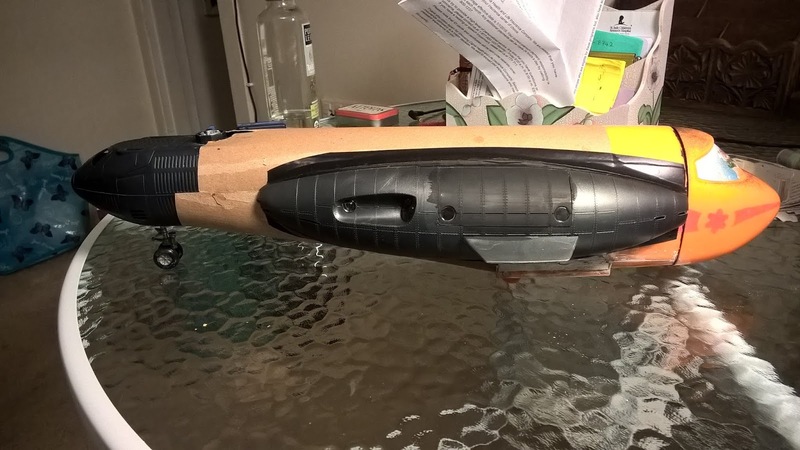 If I can glue cardboard in place once I can do it twice. But it's just so much easier to work on the thing with it open. No laproscopic surgery here. And to figure out the fit of things I tacked them together with painters tape. Which gave me an idea for later. Having a sorted that out a little better it was back to propulsion land. 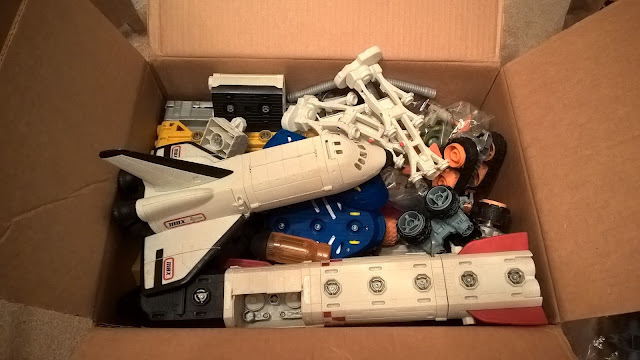 Among the parts in the big toybox were a couple of rocket sections. 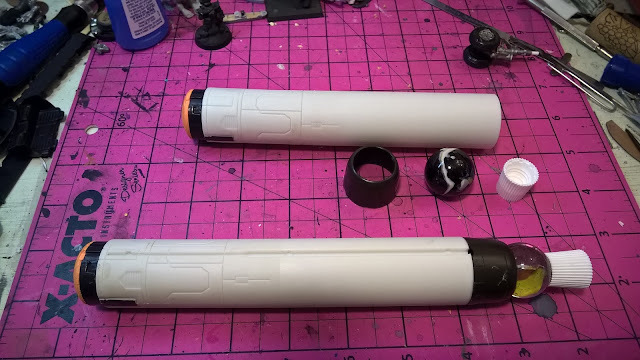 I figured the body of a booster rocket would make a nice proxy for an external engine pod. 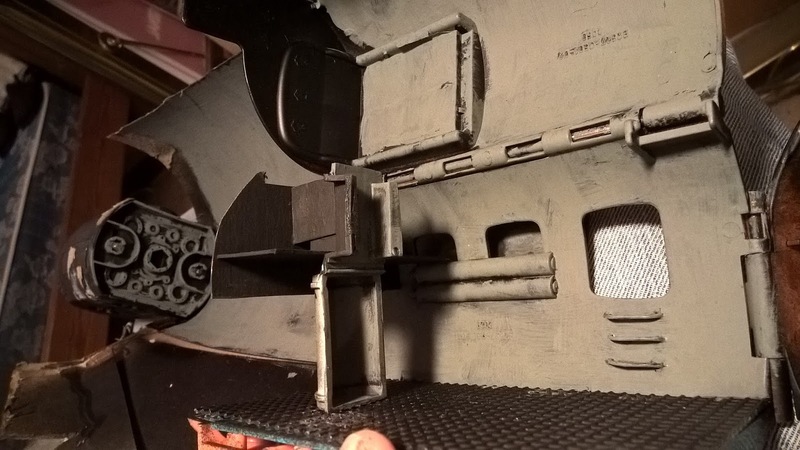 For the actual engine section I used the cowl off a Monogram C-47, a large marble (that was a painful sacrifice, by the way) and a toothpaste tube cap. You can also see more of the craft mesh material i use for my non-slip floors. For the nose gear I used the nose gear off a B-29 extended with some leftover tube from a detail brush and a piece of sprue. The landing gear bay doors are the flaps off an A-10 that's been slowly donating parts for years. 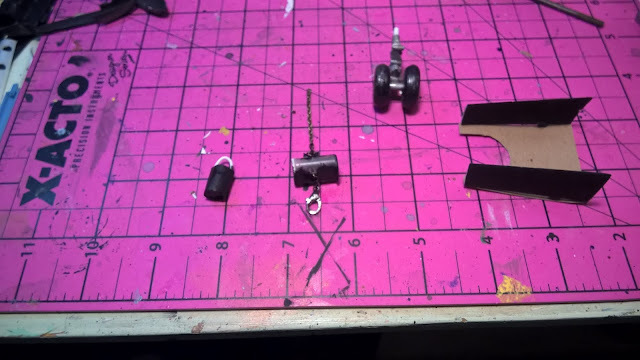 The chain motor is jewelry supplies, paper, cardstock, styrene rod, and half the cover to a disposable shaver. Here you can see things finally start to shape up. Connecting the hull halves left large gaps which needed filling. I was worried I wouldn't be able to fill them, but the painters tape looked fine. Just blue. Trouble is paper tape eventually decays. But electrical tape lasts decades. Huzzah! E-tape! (3M Super-88, even. The good stuff.) This may turn out to be a mistake, as the stuff lasts decades, sure, but not in places where people handle it. Well.. We'll see. If it falls apart I'll fix it later, I guess. 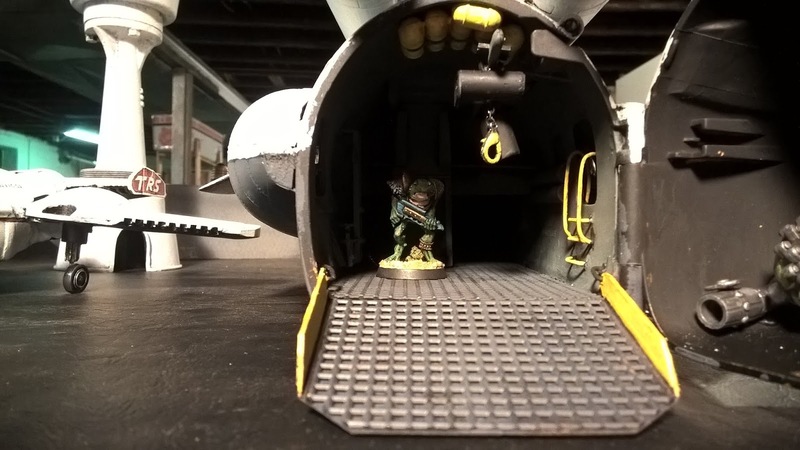 Next up I needed a load ramp to get into the cargo bay. 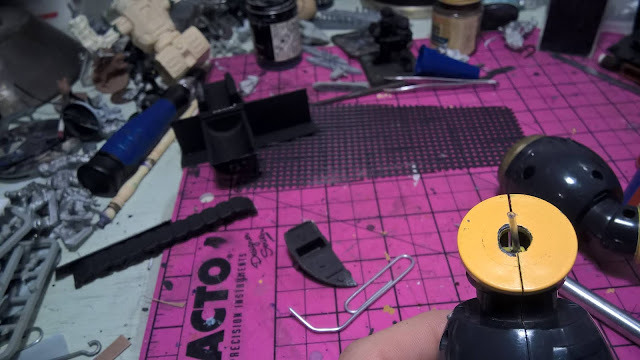 Making one out of cardstock sounded simple enough. 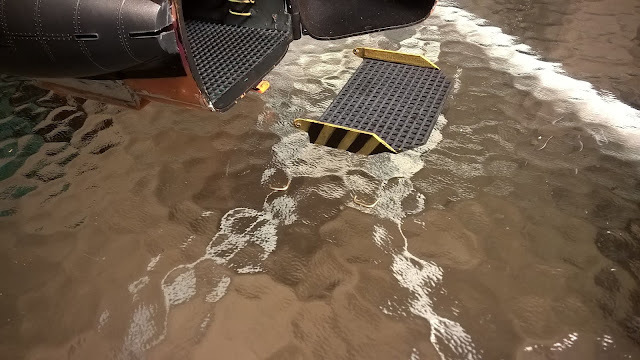 With a little standard craft grid anti-skid grating it would even look okay. I did a little quick measuring, cut the ramp to size and . . . it didn't fit. It swung up too far on its hinge. So I trimmed the front corners off and it fit better. And when I put it down it didn't lower far enough so I trimmed the back corners and angled the brace and, boom, it went up far enough and down far enough. And it even fit the mu . . . I mean burro grande. Did I say there was some Firefly in this? Totally lying. No. The big donkey has nothing to do with the mule from Firefly. And even the bilingual Chinese and . . . Spanish . . .Well, there's so much Chinese in so much Sci-Fi at this point. And has been. And, yeah, I have actual honest to god Asian family and friends. Some of whom even speak Chinese. (Among about a dozen other languages.) But anyway . 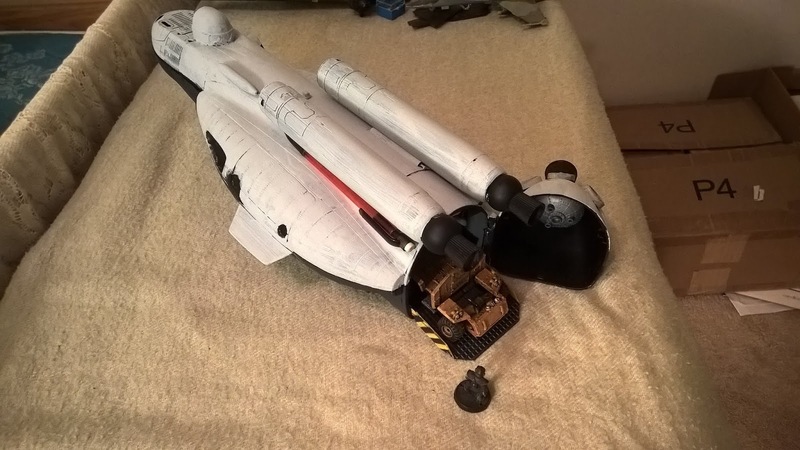 . . hat left fitting the hinge itself, closing up some gaps, fitting the engines, and painting it. The gap filling was accomplished with the usual spackle. Love that stuff. 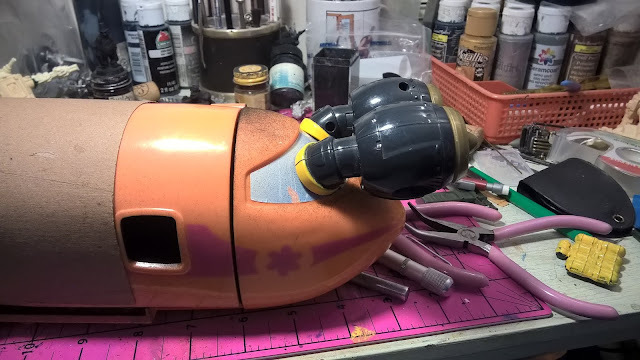 With a quick coat of paint I was getting close. 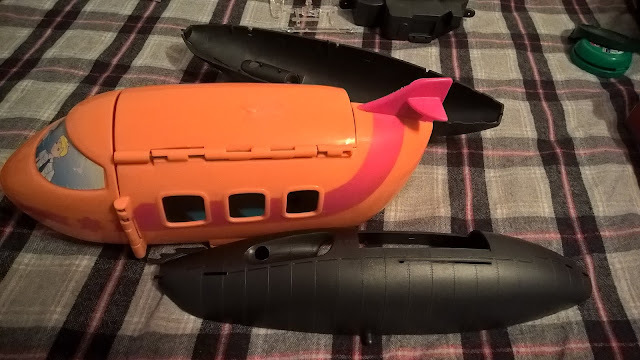 I attached the nacelles to a couple more small half pipe pieces to give them a little more separation so they didn't interfere with the aft loading door, and enough distance back that maybe the exhaust wouldn't cook the rear bulkhead. I added a main body engine to make it a tri-rocket. 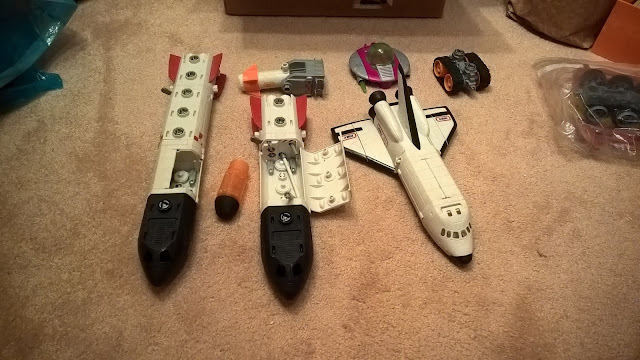 (Everyone loves a tri-rocket.) 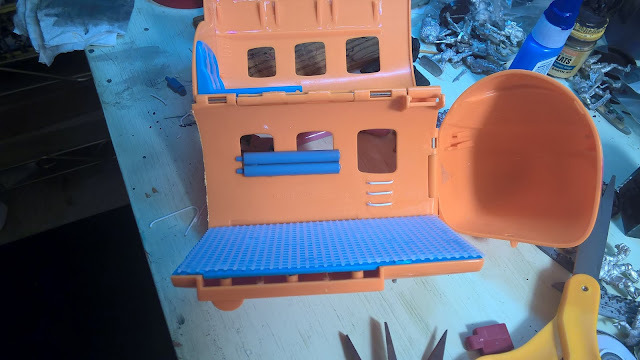 More gribble would be required inside the bay door to power that engine, but some quick test fits showed the space was there. Everything fit. It had engines. 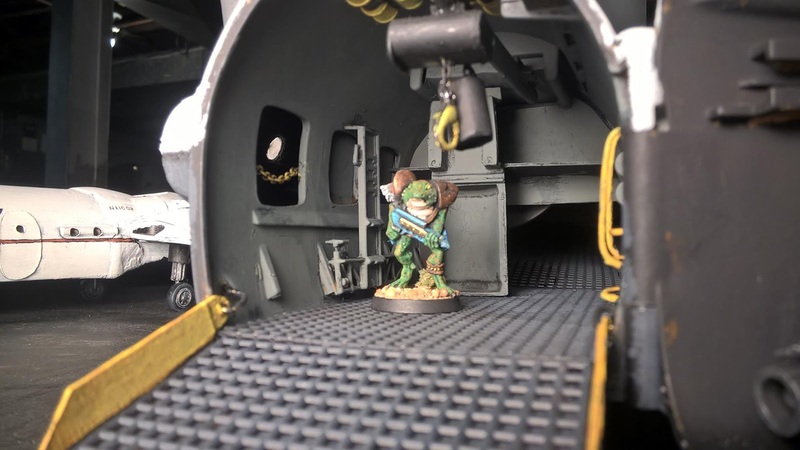 The cargo hold was practical. 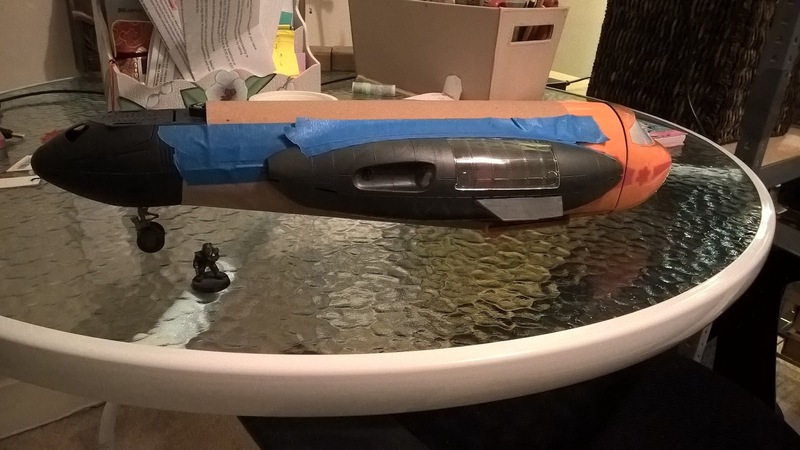 It even kind of looked a tiny bit like a lifting body, which was a plus. It's fantasy. You have to squint a little. But with some imagination (and appropriate small boy sound effects) . . . this bird was going to fly. I present to you the McDavies-Brickyard Corporation MB-1377 Starlifter. 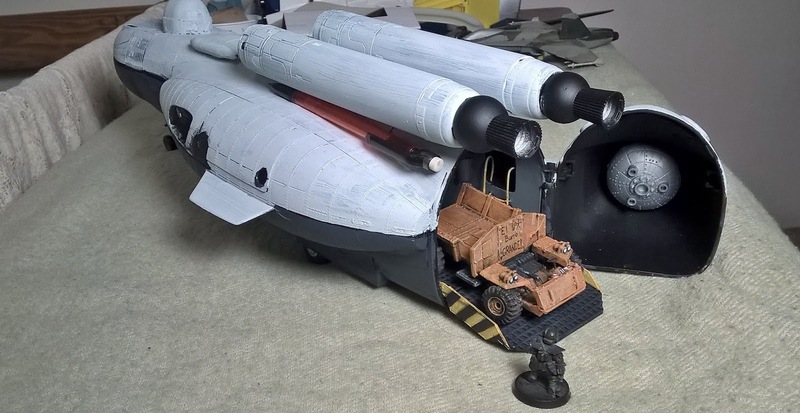 And just for the record, it's even big enough to fit a small tank. Whether the load ramp would really support that thing . . . I'm not sure. But dang, does this make me happy. This model is the purest bundle of joy I've built in a very very long time. :) And thank you so much for joining me on the flight. Fantastic! Besides being an awesome project and looking great, it also seems to have a useful footprint. The governor General's stuff is amazing but I can't even conceive of where to store something that big, let alone play with it. 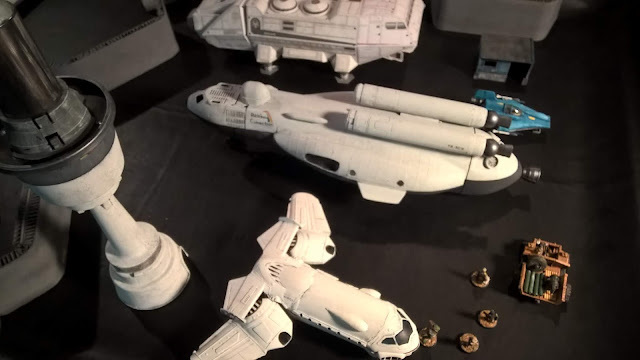 Your tramp freighter looks like it's hitting a sweet spot for table top games. Anyway . . . thank you! Glad you like the Connection! Thank you Andurian! I am deeply pleased with it. Solid work and a cool idea. 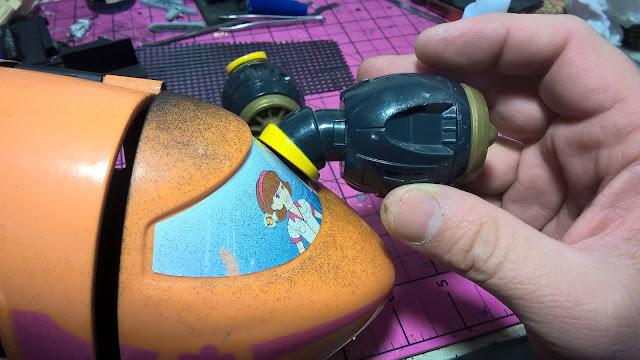 You really need to have great skill to see some old toys and see them as parts for something more. P.S. 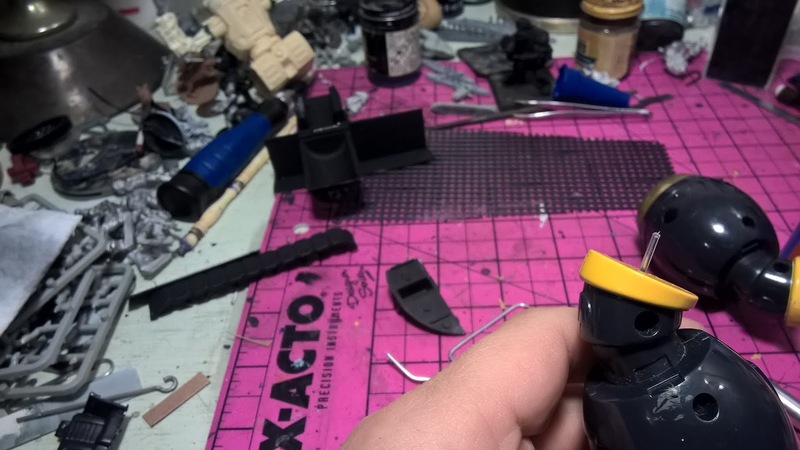 I am not sure, if I have asked - did you build any gundam model kits? First, thank you! It's a skill I learned from a few friends over the years: looking at toys different ways. Second, alas no, I have not built any gundam kits. I have piece of a three legged mech like kit that I've slowly scavenged for parts for decades. I had a four legged gundam like tank kit that I bought at a swap meet once. But I didn't really start seeing legit gundam kits until quite recently and I've yet to see one in the flesh. Had no idea they were even out there until a couple of years ago. They're tempting, I confess. I can always send one as a gift (from the standard grade-line HG 1/144). I have send few to people in USA and GB, and even Wargamers loved those. Contact me on email or hangouts. I could make a small package around April-May? Let me think on this. I cannot say I would necessarily quite follow the instructions. If you sent me such a thing it would probably end up somewhere on the Rim and looking much worse (but more interesting) for the wear. 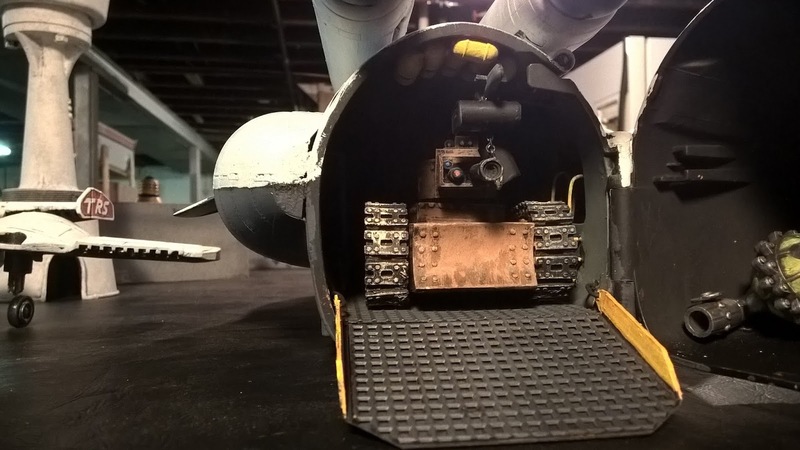 As it have all spare parts from previous versions and LOTS of equipment like both shields designs, cannon, gatling gun etc. You should have an e-mail via the account linked to your profile here. This is absolutely amazing!! The way you designed it and the level of detail in astoundishing. I enjoy this kind of work enormously, there are certainly some lessons to learn from this one, thanks for showing the whole process, it's fantastic. Thank you! We'll see what lessons I myself learn about materials five or ten years down the line, but . . . only in five or ten years. Really glad you liked it. This turned out really well! 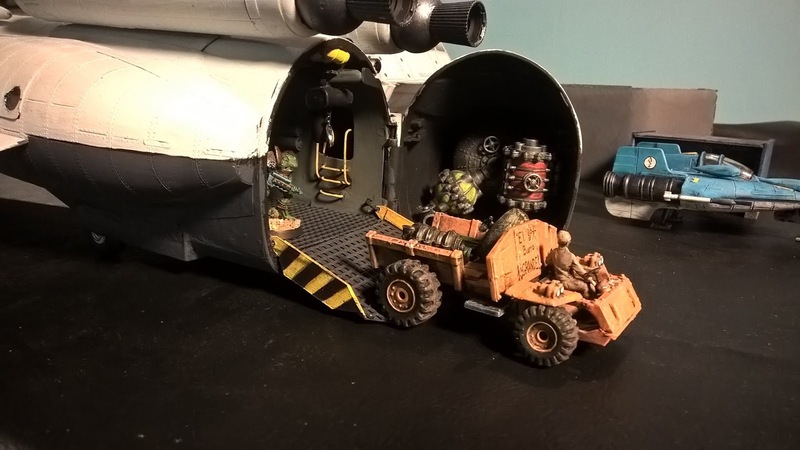 The size and the level of interaction with the opening cargo bay door and ramp are just perfect to make it terrain or something that actually moves. That was my hope. I want it to do double duty. It's useful to be able to actually put stuff inside. (Heck, I even drove from Missouri to Virginia with the little orange truck in the cargo bay and it was all fine when I got there. ) This one needed to be a "hero-grade prop" if that makes sense. When you're doing lots and lots of stuff for a theatrical endeavor some stuff will be seen more clearly or for longer, and you invest more effort in that. Stuff that will only ever be glimpsed in the background can be more rudimentary in the interest of saving time and money. The ship in the background of the above shots? Not hero grade. But still useful. I tend to think of gaming as a fundamentally theatrical endeavor. Side effect of a career in theatre, I suppose. Anyway . . . thank you! Glad you like it. Very impressive job, that has turned out very well indeed. Holy moly that's an awesome build! Apologies for being a little late to the party, but wow! Thanks for all the props, and it's really rewarding to see someone else's take on some foundational ideas and then it's all you moving it forward. The party's just getting started. You're not late at all. :) Thank you! It helps to build on a good foundation, of course. As you know well. 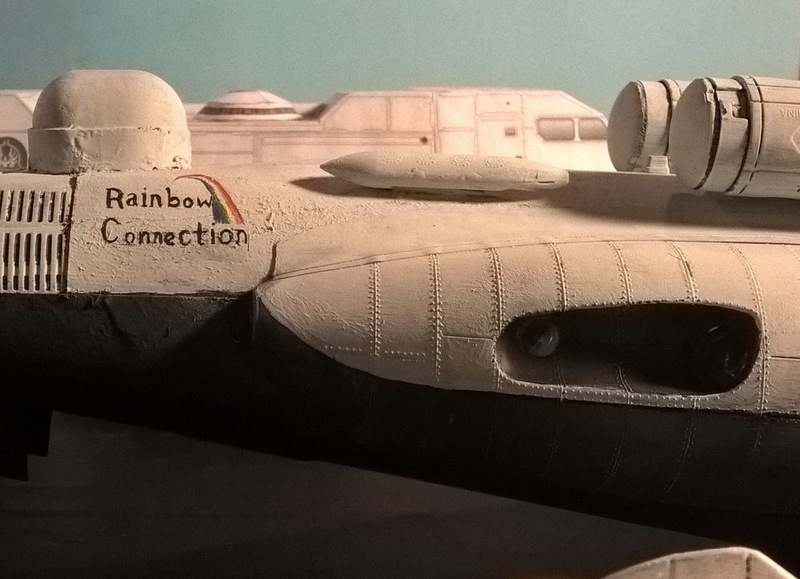 One day soon maybe The Rainbow Connection can pay a visit to the Mary Shelly. If you can get up to northern Illinois from Texas and I can get to Virginia and New Jersey from Missouri there's got to be a way.